The best part of having a baby boy in the house again is getting a second chance to dress them up anyway I want! Like wearing a fun shirt for Valentine's Day. Middle school boys so aren't game for that. But next year O will be just the right size to wear something like this Heart Stopper Valentine shirt. C-U-T-E! 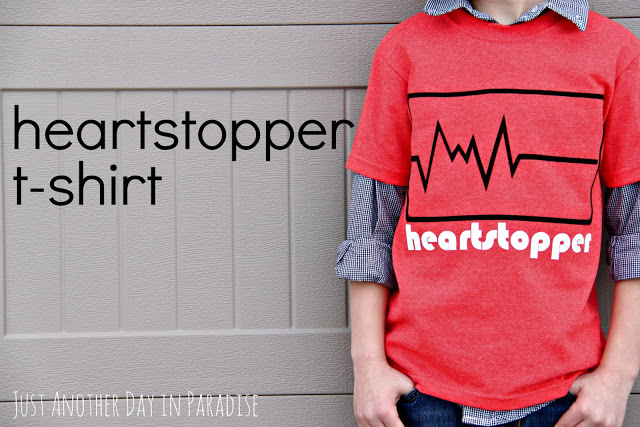 You can check out how Larissa made this Heart Stopper T-Shirt over at Just Another Day In Paradise. That's cute!! Nice to see something for a boy instead of a girl. Sheena, I have some great Valentine's Day shirts for boys in my archives!